The ability to store frames of pixel data in the on-board non-volatile memory of the W3016-16-RGB module is one of the most exciting of the many new improvements introduced with that product. The content and interactive behavior possibilities become truly limitless. Using this “video” capabilities involves a few extra challenges, however, in that the content must be authored outside of SensaSynth2 and then uploaded using the Video Upload section before you can set the video parameters outlined below. These parameters are tied to specific uploaded video content , so it is important to realize that they are not reusable on other panels the same way that presets using the other Signal Sources are. When authoring this “video” content, it is important to understand the kind of imagery or animation that works well on the low resolution Sensacell display. The general idea is also to aggregate all the different video content you want to use into a single QuickTime movie to upload, then use the interface in this section to define different parameters for start and end frames and frame rate to define multiple presets using different clips within the overall content. There really are only three parameters that are settable for a Video Signal Source: start frame, end frame, and frame rate. 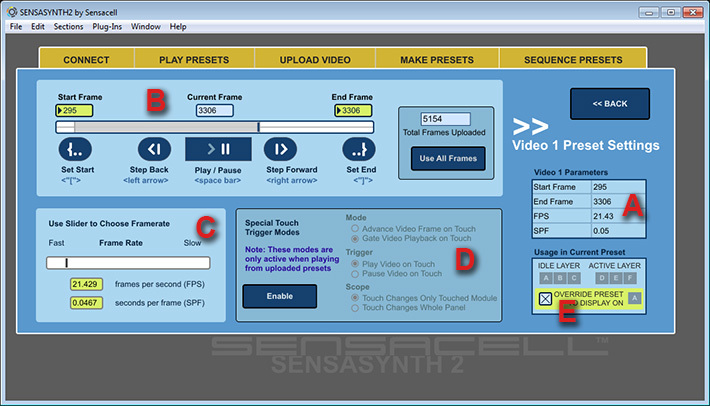 Each preset defines 2 Video Signal Sources that can be used simultaneously within a preset, although by sequencing multiple presets using differently configured Video Signal Sources a single Sensacell panel installation can show many different looks referencing different sections of the uploaded video. The Video Timeline, shown in its entirety above and by component sections in the closeups to the left, is where you can preview all parts of the video uploaded and select the portion that you want to use for this particular Video Signal Source. Set the thumb of the slider on the frame you want to use (you can click or drag on the timeline) and click the Set Start button or hit the left bracket on your keyboard (“[“). Type the number directly into the Start Frame number box and hit Enter. Set the thumb of the slider on the frame you want to use (you can click or drag on the timeline) and click the Set End button or hit the right bracket on your keyboard (“]”). Type the number directly into the End Frame number box and hit Enter. The timeline will show a shaded region designating the range of the currently defined clip. 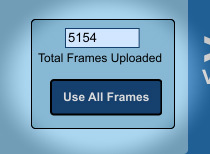 C. The Use All Frames button is a shortcut to setting the range of the current clip to the full range of the uploaded video. 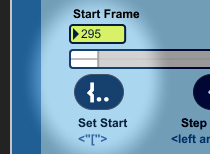 The Start Frame becomes 0 and the End Frame is the total framecount (shown above the button) minus one. 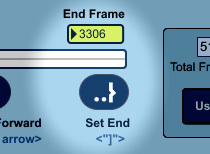 D. Step Back moves the Current Frame pointer back one frame, updating the slider position and the numeric readout in the center above the timeline. Alternatively, use the left arrow as a keyboard shortcut. The Keyboard shortcut will repeatedly fire when held down, ramping up the speed interval over the first couple of seconds the key is depressed. Step Back pauses the video when pressed, if it is playing. E. Step Forward is the same as Step Back, but moves the Current Frame pointer forward one frame and uses the right arrow as the keyboard shortcut. F. The Current Frame number box designates the frame currently displayed on your Sensacell panel as well as showing its context in the overall timeline. The number updates automatically when scrubbing the timeline slider thumb or when playing the video. G. Play/Pause toggles the video playback on your Sensacell panel. When Playing, the Video will loop within the Start and End points. When Paused, you can drag the timeline slider thumb anywhere on the slider to display any frame of the uploaded video. The space bar is the keyboard shortcut. Use the slider to set the frame rate for the video clip defined for this Signal Source. The frame rate cannot be set to an arbitrary value so a rate cannot be entered in to the number box directly. The frame rate is reported in Frames Per Second (FPS) and Seconds Per Frame (SPF). Changing the frame rate automatically triggers the Play button. Advance Video Frame on Touch. Every time you trigger the Sensacell panel, the video advances by a frame. This can happen on the rising or falling edge of a touch event (ie when you first touch the panel or when you remove your hand) – this is determined by the setting in the second set of radio buttons. The third radio set defines the scope for the action designated by the first two. The first choice set the scope to “local” – only the module where the touch event is detected is changed. The second choice is “global” – the whole panel changes. When you are finished editing your Video Signal Selector and Hit the Back button to go back to the Make Presets section, then this override is removed and the preset reverts to the settings in the current preset.